While the government has not made the report public, sources said the panel had recommended a sharp cut in all taxes on the gold business, including import duty and goods and services tax which amounts to over 13%. A committee of the NITI Aayog has recommended drastic cuts in taxes on gold and also proposed a more liberalised approach towards the yellow metal to increase its contribution to the gross domestic product to 3 per cent by 2022. 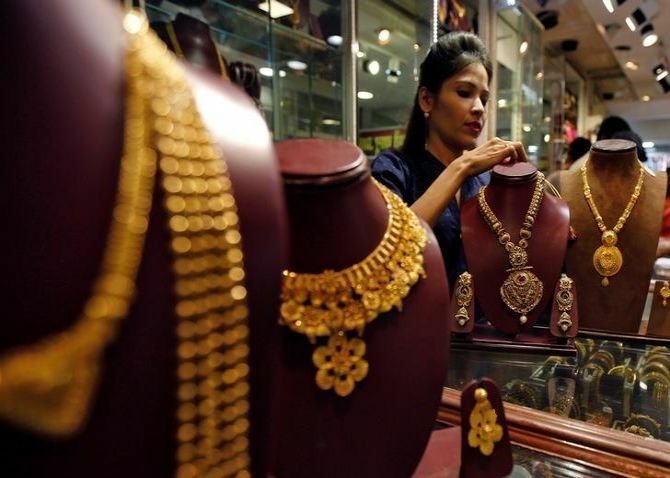 The panel headed by Ratan P Watal, NITI Aayog principal advisor and former Union finance secretary, gave its report on gold policy, titled ‘Transforming India’s Gold Market’, to the finance ministry on February 26. While the government has not made the report public, sources said the panel had recommended a sharp cut in all taxes on the gold business, including import duty and goods and services tax. Illegal gold imports have ranged between 100 and 150 tonnes annually in the past few years, and an overall cut in tax structure is required to stop smuggling, according to the report. The committee had several rounds of discussions and met a number of subject experts before the final report was submitted last Monday, after a draft report in December. Focus areas of the report, apart from cutting taxes, are promoting gold mining in India, responsible sourcing and good delivery of dore (unrefined) gold, making Indian standards for gold refined by Indian refineries, and setting up a Gold Board with statutory powers as a single-window agency to resolve all issues. The finance minister has already announced formulating a comprehensive gold policy and setting up a gold spot exchange. The committee has proposed policy measures from mining to marketing of gold. It also wants the jewellery business to be hassle-free, as “it is a productive business and the industry ecosystem consisting of 90-95 per cent of medium and small units employs 6.1 million people”. It also said the investment part of gold import, a little over 16 per cent, was unproductive. The committee proposed the government see gold with the above perspective and offer alternatives for gold investments without imports. It proposed revamping the gold monetisation scheme and that all banks and their branches offer the service, reducing minimum quantity of gold to be offered by customers under the GMS. The committee also proposed making GMS attractive enough for banks by linking gold metal loans with international lease rates. As of now, some banks hedge working capital finance cost by importing gold on lease from overseas banks and lending the same gold as gold metal loans to Indian jewellers. In yet another proposal to give an alternative for gold investment, the committee proposed to replace sovereign gold bonds with gold saving accounts, with all conditions and provisions similar to the current SGB. However, after banks make proper arrangements, gold investment in rupee terms in proposed savings accounts should be backed by physical gold lying with Indian households. Another important recommendation is to set up a gold domestic council in line with export promotion council chaired by a joint secretary level official. The report proposed a liberal PAN (permanent account number) limit and a new limit for providing data to respective organisation under the Prevention of Money Laundering Act. The gold trade had different reactions to the proposal with many expecting jewellers’ role to be enlarged in schemes like GMS and gold savings account, while they are divided on duty front. Some say that including GST and import duty, the tax on gold is over 13 per cent, which should come down to discourage smuggling, but another section says the cost benefit ratio to cut total duty on gold, which is otherwise coming through illegal route doesn’t benefit as revenue forgone for 100-150 tonnes of gold in duty terms is less than revenue loss if overall duty is reduced. Want to make money betting on gold? Are gold bonds the best way to invest in yellow metal?